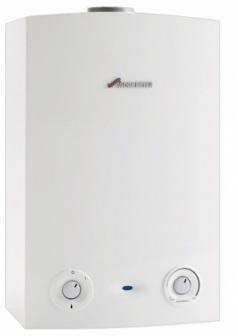 The Worcester-Bosch Greenstar 15Ri is one of the smallest of the regular also known as conventional or traditional condensing boilers available form Worcester-Bosch. The appliance is capable of outputting between 3.7kW and 12.3kW to domestic hot water and central heating systems but is no less efficient than some of its more powerful cousins. Indeed the Worcester-Bosch Greenstar 15Ri is 91% energy efficient in its natural gas guise and 89.8% energy efficient in its LPG (Liquefied Petroleum Gas) variant meaning that it is classified as A rated for energy efficiency by SEDBUK. This is in comparison to an efficiency of around 75% or less for some other conventional boilers especially older boilers so it is easy to see how the Worcester-Bosch Greenstar 15Ri can reduce your domestic fuel costs and your carbon footprint. The Worcester-Bosch Greenstar 15Ri is also compact in terms of its dimensions H600mm x W390mm x D270mm and weighs just 22.6kg so can be installed in a kitchen cupboard an airing cupboard or in a different location depending upon your specific requirements. The appliance is supplied with a wall mounting bracket for attachment to a wall surface and levelling screws which allow the boiler unit to be adjusted so that it lies plumb against the wall.